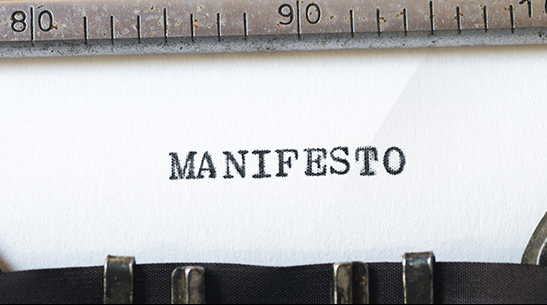 The Robot Manifesto will be a Code of Conduct for all stakeholders in the field of robotics, automation technology and artificial intelligence. It is based on the dialogue with all involved stakeholders, such as manufacturers, scientists, governments, society as well as ethicists. The main goal of everybody involved should be to meet the needs of the current stakeholders without compromising the prospects of future generations. To ensure this inter-generational justice, a set of voluntary rules for the development and use of technologies is established, in order to achieve a self-regulation that complements the current legal situation. The outcome of this discussion on the benefits and risks of these technologies as well as new innovations should be a general consensus. Stakeholders that apply the rules of the Robot Manifesto should, in the next step, be offered the possibility to have themselves certified. On the other hand, companies or parties which disregard these rules could suffer a reputational damage. This is just one of the reasons why engaging and informing society will be a crucial success factor for Robotic Governance. Of course, the Robot Manifesto is still a work in progress, but many positives examples regarding self-regulation, Corporate Social Responsibility and Codes of Conduct demonstrate that it is possible to make such a concept work. Legislation is regionally restricted and takes time to react to new developments and innovations. Therefore, the Robot Manifesto is complementing instead of replacing jurisdiction. Thanks for sharing. Your post is a useful coboninutitr.